Published by Pozol Collective, 6th of March 2017, Chiapas. Jmololabex ants winiketik icha spatil a wotanik ta pisilik machatik nokol skoltabel te lum kinalik te yuun ta skuenta te nokol spojbel te chopol ajwalil. Compañeros and compañeras, this communication comes from the adherents to the Sixth Declaration from the ejido of San Sebastián Bachajón, Chiapas, with greetings of struggle for your organisations and peoples in resistance. In this communique, we raise our voice to demand justice and the immediate freedom of our three compañeros imprisoned in different detention centres. 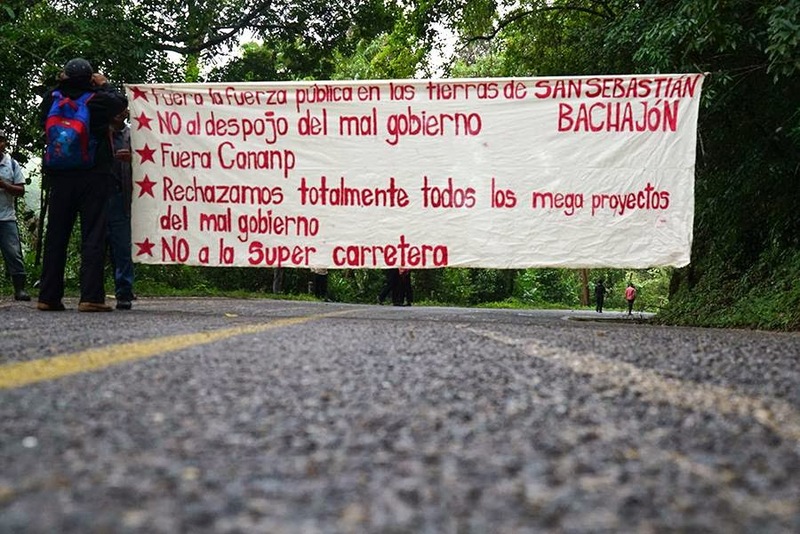 Today the compañeros who are adherents to the Sixth, of the Ejido San Sebastián Bachajón, find ourselves in Nahilte, on the road between Palenque-Ocosingo, holding a road block. We are from the three centres that make up the Ejido, and we are determined to carry out this peaceful direct action, to demand the freedom of our unjustly imprisoned compañeros with immediate effect; prisoners of conscience Esteban Gómez Jiménez, imprisoned in San Cristóbal de las Casas, Chiapas, (CERSS #5), and Santiago Moreno Pérez and Emilio Jiménez Gómez, imprisoned in Playas de Catazaja, Chiapas (CERSS #17). They were arbitrarily detained, their crimes were fabricated and they were imprisoned following false accusations for crimes they never committed, simply because they were committed to fight for and defend Mother Earth. This was their crime, speaking up and defending natural resources, territory and life. We also denounce the actions of official ejidal commissioner Manuel Guzmán Alvaro to promote, together with the Agrarian Commission the advancement of PROCEDE and FANAR, to parcel off our land with the aim of privatising it and stripping our people of it, in the interest of Big Business (megaproyectos). We reject the ejidal commissioner’s work for the Bad Government and beseech the people of San Sebastián Bachajon not to be taken in by the lies of the commissiones and the Bad Government. We do not need PROCEDE or FANAR, because as peoples, we have learned how to defend our land and see autonomy as the solution to all problems within the community. From the northern part of Chiapas, men and women of San Sebastián Bachajón send greetings of struggle to all the compañeros and compañeras, communities and peoples, of Mexico and the world, who fight and resist bad governance. Juan Vázquez Guzmán lives, Bachajón struggles on! Juan Carlos Gómez Silvano lives, Bachajón struggles on! No to the eviction of indigenous lands! State police out of our indigenous territory! Immediate presentation of the compañeros disappeared and assassinated in the normal school Raúl Isidro Burgos in Ayotzinapa! ¡JUSTICE FOR OUR COMPAÑERO JUAN VAZQUEZ GUZMAN, AYOTZINAPA, ACTEAL, ABC, ATENCO! Compañeros and compañeras, the Adherents of the Sixth Declaration from the ejido San Sebastián Bachajón send you, your organisations and your communities in resistance combative greetings. In this month of February 2017, we remember that 6 years have gone by since the operation ordered by Juan Sabines Guerrero and Noé Castañón León to evict and dispossess us of our territory was carried out by more than 800 agents from different state and federal police forces. This violent, abusive and invasive police operation into our indigenous territory was with the clear objective of definitively appropriating our land for their economic gain. Among other consequences were the persecution of Sixth Bachajón comrades, the arbitrary arrest and unjust imprisonment of more than 100 of our comrades, who were separated from their families and deprived of their freedom. All on the whim of the bad government because we did not obey its order to release control of the collection booth and access to the Agua Azul Waterfalls, which we had built on our ejido lands. This access point is strategically located. The Bad Government seeks control of the booth to serve interests completely indifferent to the social benefits and the collective indigenous community of the ejido. This mega police operation was being schemed and prepared since the end of 2010 in Tuxtla Gutiérrez, Chiapas by Noé Castañón León and the San Sebastián Bachajón PRIist ejido commissioner Francisco Guzmán Jiménez also known as ‘el Goyito’. ‘El Goyito’ is also the same person who threatened to kill our compañero Juan Vázquez Guzmán before his actual murder on 24 April 2013. For approximately a year before this operation was carried out, our organisation had maintained a land defense camp on the road that leads up to the Agua Azul Waterfall. This was done through collective training, organisation and work, we also charged tourists for the entry to our lands on the ejido San Sebastián Bachajón, and this was for the general benefit of all the ejido and not just our organisation. The operation took place then because the Bad Government took advantage of the moment to repress, persecute and violate the human rights of our people. This was when Tatik Samuel Ruiz passed on to a better life and the director of the Human Rights Center Fray Bartolomé de Las Casas Diego Cadenas Gordillo went to work with the Bad Government alongside Juan Sabines Guerrero in the State Human Rights Council just a few days after the death of Tatik Samuel. This is what the former director of Frayba Marina Patricia Jiménez Ramírez also did, and she earns approximately 100 thousand pesos per month. The death of Tatik Samuel created conditions which allowed the Bad Government to intensify attacks on indigenous communities living in resistance in Chiapas, including the defense of the land of San Sebastian Bachajón and all of this contributed to the chain of events that have so far occurred. Our organization continues to stand up and defend our territory. We are more aware of our rights as an indigenous people, we seek to build an autonomy as an organization and as human beings. We support all people who live any injustice, whether you belong to the Sixth or not, Zapatista or not Zapatista, Catholic or non-Catholic. If you are a person who lives injustice as we do, we will do what we can to support you. We also continue to fight for our prisoners who belong to everyone, not just us. And all other prisoners too; these prisoners can count on San Sebastian Bachajón’s word of solidarity and unselfish interests. It takes a lot of organization, coordination and solidarity to liberate our compañeros who have been in prison for many years, and becoming poorer, sicker and less hopeful. Despite our economic poverty we are full of pride and enthusiasm to provide legal and political accompaniment to our our compañeros and to contribute something to their freedom. We humbly ask for your support in your own way that allows them to get out of the Bad Government’s dungeon and to free other fellow prisoners in Mexico and the world. Santiago Moreno Pérez, prisoner in Playas de Catazajá Prison, is originally from La Pimienta and was serving as an Adviser to the Sixth’s Autonomous Security Council in 2009 when a serious problem occurred in the community. He and his son Sebastian were accused of murdering another La Pimienta resident. The community gathered to lynch them, but then decided not to kill them and turned them over to jail, but they also took all of their possessions before doing so. Some days later Santiago’s wife died and his children were orphaned. Apprehension orders have also been issued for the children accusing them of the same crime as Santiago. The compañero’s current situation is that he is still on trial. Many of his rights have been violated, and they rescheduled his case once, and that is why he has been unjustly detained for almost 8 years. Emilio Jiménez Gómez, prisoner in Playas de Catazajá Prison, originally from Xanil, Chilón, Chiapas, is accused of assaulting an Italian tourist who was passing through Xanil community. Emilio, along with his father, were detained without an apprehension order by PRIista residents of the community. His father was released by the Palenque Public Prosecutor’s Office, but Emilio has been jailed since 2014. The compañero is awaiting sentencing and we expect that it may happen any day soon. Esteban Gómez Jiménez, prisoner in the San Cristóbal de Las Casas Prison in Chiapas. He is originally from Salto de Tigre, Chilón, Chiapas, and he is accused of several serious crimes, like felony homicide, two violent assaults on tourists, and possession of a weapon of exclusive use to military. So far, he has been cleared of the charge of murder and possession of the military weapon, but the two charges of assault are still pending. Because he was attacked by other prisoners when he was in El Amate Prison, he asked to be transferred to the San Cristóbal de Las Casas Prison, which is where he is at the moment. Considering the local and the national situation, we reaffirm our commitment and belief in the preparatory work that we are carrying out alongside the National Indigenous Congress and the Zapatista Army of National Liberation. The work is urgent and necessary in order to transform the reality of the country. Dispossession, repression, and contempt of the Bad Government is what will continue to be our reality unless we but brakes to their injustices. From the Northern Zone in the state of Chiapas, the women and men of San Sebastián, we send you combative greetings. Long live Juan Vázquez guzmán, and Bachajón’s struggle! Long live Juan Carlos Gómez Silvano, and Bachajón’s struggle! No to the dispossession of indigenous lands! State police, Out of indigenous lands! Immediate return of the disappeared and murdered “compañeros” from the teachers’ school Normal Raúl Isidro Burgos de Ayotzinapa! Justice for our compañero Juan Vazquez Guzman, Ayotzinapa, Acteal, ABC, Atenco! We do not send greetings. Before it occurs to you to try (as the PGR [i] is already attempting in Nochixtlán) to blame the cowardly aggression against the people’s resistance encampment in San Cristóbal de Las Casas, Chiapas on ISIS, we would like to provide you, at no charge, the information we have collected on the subject. (NOTE: he is referring to the incident in which a group of indigenous people affiliated with the Partido Verde Ecologista (Green Ecology Party) put on ski masks and went to create chaos at the [teachers’] blockade between San Cristóbal and Tuxtla Gutiérrez, the capital of Chiapas. When they were detained by the CNTE’s [teachers’ union] security, they first said they were Zapatistas (they weren’t, aren’t, and never will be), and later admitted they were partidistas. We are sure that you don’t know this (either that or the stupidities that you commit are because you are in fact stupid), but the so-called “teachers’ conflict” arose because of the stupid arrogance of that mediocre police wannabe who still works out of the Department of Public Education (SEP by its Spanish acronym. Oh you’re welcome, no thanks needed). After the teachers’ mobilizations and the government’s response in the form of threats, firings, beatings, imprisonment, and death, the teachers in resistance managed to get the federal government to sit down to dialogue. This is in fact a federal issue. It is up to the federal government and the teachers in resistance to dialogue and come to an agreement or not. You sympathize with the hard-headedness of that mediocre policeman. We Zapatistas sympathize with the teachers’ demands and we respect them. This applies not only to the CNTE, but to the entire people’s movement that has arisen around their demands. As Zapatistas, we have made our sympathy public by supporting them in word and deed, with the small amount of food that we could put together from our own tables. The movement has been able to generate and concretize the sympathies of the people, while you all only generate dislike and repudiation. As we were already saying as of two months ago, the movement already encompasses various social sectors and, of course, their specific demands. For example, you’re not around to hear it but people are demanding Cancino be removed from office (the supposed municipal president of San Cristóbal de Las Casas, a city in Chiapas, Mexico, in case you didn’t know) and Narciso be put in jail (the paramilitary boss of the ALMETRACH.) [v] This and the other things they are demanding can be summarized in one word: good government. How long will it take you to realize that you are just in the way, parasites that infect the entire society, above and below? The thing is that you all are so sure of yourselves that you send your attack dogs to steal the few belongings of these people who are PEACEFULLY protesting. Well, we Zapatistas will again begin to collect the food and basic necessities you stole from them and supply them once again. And we will do so over and over again. Instead of making ridiculous declarations (like denying having a role in that cowardly attack on the people’s encampment in San Cristóbal), you could contribute to the easing of tensions necessary for this dialogue and negotiation to take place as determined by both parties (which are, we might remind you, the Federal Government and the National Coordination of Education Workers). It would be a good idea to tie up your attack dogs (Marco Antonio, Domingo, and Narciso). Just whistle and shake a wad of bills at them and you’ll see how they come running. And some unsolicited advice: don’t play with fire in Chamula. The unrest and division you are inciting in that town with your stupidities could provoke an internal conflict of such terror and destruction that you wouldn’t be able to quash it with social network bots or paid “news” articles or the little money that Manuel Joffrey Velasco Baratheon-Lannister has left in the state treasury. So be calm. Be patient and show some respect. We hope the federal government will dialogue and negotiate with seriousness and commitment, not only because the teachers’ demands are just, but because this might be one of the last times there is someone with whom to dialogue and negotiate. The process of decomposition you have encouraged is so advanced that soon you won’t even know who to slander. Plus there won’t be anyone on the other side of the table. Understood? So, do your thing. That is, go back to Photoshop, to the celebrity news, the flashy parties, the spectacle, the gossip magazines, to the frivolity of those who lack intelligence. Govern? Oh come now, not even the paid media believe you do that. It’s better that you step aside and learn, because this is Chiapas, and the Chiapas population is a lot to take for such a lame government. As Zapatistas it is our conviction—and we act in accordance—that the movement’s decisions, strategies, and tactics should be respected. This applies to the entire political spectrum. It is not acting in good faith to hitch oneself onto a movement and try to steer it in a direction outside of its internal logic. And that goes for attempts to slow it down or speed it up. If you can’t accept that, then at least say clearly that you want to use this movement for your own ends. If you say so directly, perhaps the movement will follow you, perhaps not. But it is healthier to tell the movement what you are seeking. How do you expect to lead if you don’t respect the people? We Zapatistas are not going to tell our current teachers (those from the CNTE and also from the towns, barrios, and neighbourhoods that support them) what to do and what not to do. This should be crystal clear to all noble people in struggle: ANY ACTION TAKEN BY THE ZAPATISTAS IN RELATION TO THE CURRENT POPULAR MOVEMENT (or those that later emerge) WILL BE PUBLICLY MADE KNOWN AHEAD OF TIME, always respecting the movement’s times and ways. The National Coordination of Education Workers as well as the originary peoples’ movements, neighbourhoods, and barrios that support the teachers should understand that whatever decisions they make—whether about their path, their destiny, their steps, or their company—they will have our respect and our salute. This thing of dressing up like Zapatistas and yelling slogans that involve others is fine as a bit of entertainment and a line on your resumé, but it is nevertheless false and dishonest. We did not rise up to hand out stolen junk food, but rather for democracy, freedom, and justice for all. If you think breaking windows and stealing food that isn’t even nourishing is more revolutionary and of more help to the movement, well, let the movement decide. But clarify that you are not Zapatistas. We don’t care when people tell us we don’t understand the “conjuncture,” or that we don’t have a vision of how to use electoral advantage, or that we are petit-bourgeoisie. We only care that that teacher [maestro, maestro] that señora, that señor, that young person [joven, jóvena] feel that here, in the mountains of south-eastern Mexico, there are those who love them, respect them, and admire them. This is what we care about, even though such sentiments do not come into play in grand electoral strategies. The teachers in resistance and, now more and more often, the people’s movement that gathers around them face very difficult adverse conditions. It isn’t fair that, in the midst of all of that, they have to deal not only with clubs, batons, shields, bullets, and paramilitaries, but also with “advice,” “orientation,” and “with-all-due-respect”-type orders telling them what to do or what not to do, or whether to advance or retreat—that is, what to think and what to decide. We Zapatistas don’t send junk food to those who struggle, but rather non-GMO corn tostadas which are not stolen but rather homemade through the work of thousands of men and women who know that to be Zapatista does not mean to hide one’s face but rather to show one’s heart. Because reheated Zapatista tostadas relieve hunger and inspire hope. And you can’t buy that in convenience stores or supermarkets. [ii] Refers to someone affiliated with one of the registered political parties. [iii] “Croquetas,” or doggy biscuit, was the nickname assigned by the EZLN to Roberto Albores Guillén, governor of Chiapas from 1998-2000. [iv] This likely refers to ex-president Felipe Calderón who recently took a job with a subsidiary of Iberdrola. [v] La Asociación de Locatarios del Mercado Tradicional, Traditional Market Tenants’ Association. On Wednesday afternoon, about 200 people carrying sticks, machetes and guns attacked the blockade being maintained by teachers, students, parents, representatives of more than fifty neighbourhoods of the city of San Cristóbal and members of various organizations on the toll road between San Cristóbal and Tuxtla Gutierrez. They have maintained the blockade since June 27 to demand the repeal of the education reform. Accompanied by municipal and state police, the attackers attacked the blockade’s tarpaulins and tents, kicking them and destroying them with machetes, and setting them on fire, while the police surrounded them to allow them to carry out their action. During the attack, a bullet wounded the elementary school teacher, Romualdo Guadalupe Urbina, who received a 22 calibre bullet wound in the collarbone. Another participant of the blockade was run over and suffered a fractured tibia and fibula. Both were admitted to the clinic of Institute for Social Security and Services for State Workers, while residents of the neighbourhood where the clinic is located blockaded the Santa Martha bridge and the clinic access roads “to protect the wounded”. The attack was perpetrated by several dozen people who are officials of San Juan Chamula and involved over a hundred indigenous men from San Cristobal. The teachers identified them as part of the Association of Tenants of Traditional Markets of Chiapas (Almetrach), headed by Narciso Ruiz Sántiz, who, in previous days had threatened to attack the blockade. These groups are identified with the Ecologist Green Party of Mexico (PVEM), which governs both municipalities [and the state government]. The teachers of Section 7 of the National Union of Education Workers (SNTE), who belong to the National Coordinating Committee of Education Workers (CNTE), and parents supporting them did not respond to aggression and were forced to retreat and regroup in the central park of the San Cristóbal. The violent eviction began at 12:30pm. Carrying a few small banners and brandishing sticks, machetes and stones, the attackers arrived assuring it was “in peace”, but immediately they began to lash out against the installations of the blockade and remove logs, tyres, rocks and other obstacles. Behind them came a heavy truck and several pickup trucks sounding their sirens and carrying state and municipal police. The police did not directly involve themselves in the eviction; they only protected the indigenous men who destroyed and burned the tarps and tents. Some attackers assaulted Dolores Rodriguez, a reporter for Noticiero Networks, for taking photographs. One of the assailants pointed a gun at her head. Others shot firecracker rockets [used to announce neighbourhood fiestas] in horizontal paths into the woods. Shortly after, the police left and the place was under the control of the attackers. Adalberto Hernandez Rabanales, leader of Section 7 in the Highlands Region [of Chiapas], described them as a “shock group” and blamed the government at all three levels [municipal, state and federal]. When the local police withdrew, the teachers and members of civic organizations regrouped a hundred meters away, near the Hospital of Cultures. When they returned to try to rescue vehicles, the masked men fired at them. It was then that Urbina Estrada was wounded. Later, six Federal Police (PF) patrol cars arrived. The burning and destruction of the encampment continued under the surveillance of the police. The action ended at 3pm, when the masked indigenous men left the place. The group from San Juan Chamula boarded a bus belonging to the Christopher Columbus bus line and the largest group marched in formation back to San Cristobal. The place remained under the charge of the three Federal Police patrol units until 4pm, when dozens of residents from the south side of San Cristobal returned with sticks and stones which they threw at the patrol cars. The police then left in their vehicles and stopped a kilometre away. Within minutes, the blockade was restored. During the evening, more people kept arriving, and they extended the obstruction of the roads with bonfires, logs and pieces of iron. Again, there were several hundred parents, teachers and residents of different neighbourhoods, all in an atmosphere of excited tension. In the afternoon, the teachers marched in the streets of the centre [of San Cristóbal], while in the park a group of hooded youths set fire to the wooden doors of the old city hall (which is being turned into a museum) and entered the building, breaking all the windows. Smoke came out of some windows. Meanwhile, unidentified indigenous masked men, unrelated to the organizations that support the teachers, ransacked an Oxxo [convenience store] located half a block from the former city hall. They handed out cigarettes, drinks and other products to children and youths, creating a commotion. The mayor of Chamula, Marco Antonio Gonzalez Cancino, disavowed any responsibility in the eviction. “If evicted, they will return. Time and time again. It turns out that down here, there is no fatigue,” read the letter. Mexico’s Zapatistas stood behind the striking CNTE teachers whose blockade was attacked Wednesday by a masked group, calling the attack a “definitive disaster” in an open letter published Thursday. Ten trucks loaded with a group of masked men came to the camp at highway San Cristóbal-Tuxtla Gutiérrez in Chiapas, where about a hundred protesters had gathered, forcefully evacuating the only camp that civil society and teachers of the National Coordinator of Education Workers, CNTE, held in the state of Chiapas, Wednesday. The group at first identified as Zapatistas, but locals knew otherwise, according to those quoted in the letter. The “paramilitaries,” who were members of the PRI-allied Ecologist Green Party, were paid, said the letter. They were protected by policemen, according to witnesses, and “were not, nor are, nor will ever be” Zapatistas. “We Zapatistas, will not send junk food to those who fight, but toasted non-transgenic corn, not stolen, but rather made with the work of thousands of men and women who know that being Zapatista is not to hide one’s face, but to show their heart,” read the letter signed by Subcomandante Insurgente Moises and Subcomandante Insurgente Galeano. The letter, dripping with contempt for the actors behind the attacks, also struck a rebellious tone, saying that repression would not stop the movement. “As the brother Indigenous peoples did in Oaxaca, if evicted, they will return. Time and time again. It turns out that down here, there is no fatigue,” read the letter. The letter by leading figures in the Zapatista movement pledged to continue to support the striking teachers and their supporters without dictating what steps the movement should take. “The National Coordinator of Education Workers, as well as the movements of indigenous peoples, (and) neighbourhoods that support the teachers, must understand that, whatever their decision, be it on the route, the destination, the steps and the company they keep, you will receive our respect and greeting,” said the Zapatistas. Teachers affiliated with the CNTE have been protesting neoliberal education reforms implemented in 2013 by President Enrique Peña Nieto. A crackdown by police, which left at least nine people dead, drew world-wide condemnation. Talks between the union and the government have failed to produce a resolution. 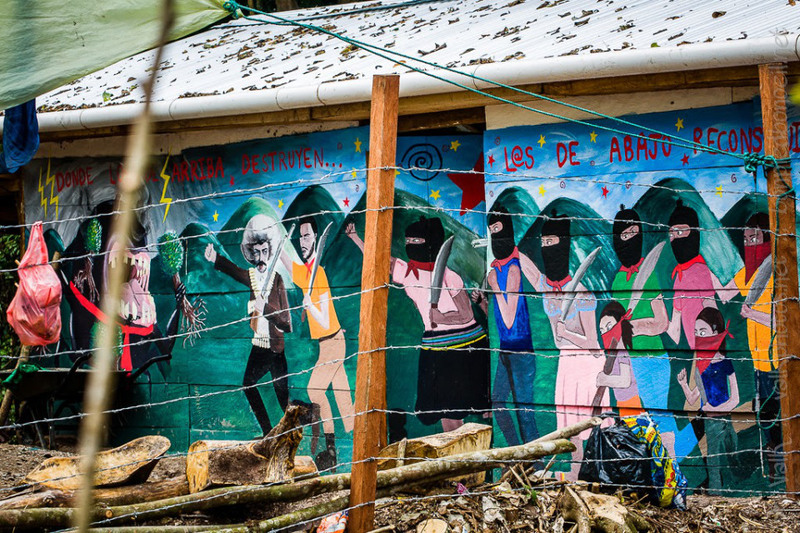 The communities in rebellion and resistance, adherents to the Sixth Declaration of the Lacandona Jungle of the EZLN, those of us who make up the space Semilla Digna (Candelaria el Alto, San Isidro los Laureles, San Francisco, Grupo de Trabajo No estamos todxs, Alcanfores, San Isidro del Ocotal and Cruztón), express our solidarity with your dignified struggle because we feel like you, against the structural reforms of the bad government. Also, as indigenous communities, we have suffered humiliation, contempt, displacement and neglect. We understand well your struggle because we share the same struggle, and we share the pain and rage in our hearts. As such, we are with you in support with our presence and our word. We want to encourage you because we already know of the aggression and violence with which the bad government represses the people in resistance. We want to say to you that you are not alone, and that we, as indigenous men and women of our lands and communities, as organizations in resistance, we are with you and we share your path. We want to say to you that also with the action you have taken, you are raising consciousness in civil society more and more, making visible the lies that the bad government tells in response to our demands. We demand the immediate liberty of all of the compañerxs unjustly imprisoned for protesting, and we ask that their rights be respected, and, more concretely, the liberty of all the teachers and the civil society which supports them, who in recent weeks have suffered repression and imprisonment for exercising their right to demonstrate against the misnamed structural reforms, when all these will do is to continue to deprive everyone of a dignified future. We condemn and hold responsible the three levels of the bad government for all the harassments and assassinations that they have already committed, and for whatever future action may be carried out against the organizations, collectives, neighbourhoods, parents of families, students and teachers here present. Forward compañeros! Your struggle is our struggle. Receive a great combative hug from all communities that make up the space of struggle known as Semilla Digna. If you injure one of us, you injure all of us! Today Friday we have come together in a roadblock at these high points of our territory in the ejido San Sebastián Bachajón, and in 15 days’ time it will be a year since the cruelty committed by the Mexican state, killing 3 people, leaving 3 in a state of coma due to the repression they suffered and with another 43 young normal school students disappeared from Ayotzinapa. These figures are in addition to thousands of others assassinated and disappeared throughout the country, as well as political prisoners incarcerated for their commitment to the defence of our territory and life as indigenous and non-indigenous peoples. We hold the bad government responsible for the murders of our compañeros Juan Vázquez Guzmán on 24th April 2013 and Juan Carlos Gómez Silvano on 21st March 2014; at the same time we demand the freedom of our others unjustly imprisoned, Esteban Gómez Jiménez, prisoner in Cintalapa De Figueroa, Chiapas (Amate #14), Santiago Moreno Pérez and Emilio Jiménez Gómez, prisoners in Playas De Catazaja, Chiapas (Cereso #17), who were imprisoned for having the commitment to defend our mother earth, we also call for the freedom of other prisoners of Mexico and the world. We denounce those responsible for the release of the two intellectual authors of the murder of the teacher and compañero Galeano by the self-appointed “judge” Victor Manuel Zepeda López, of the criminal court in Comitán de Domínguez, Chiapas, on 12th August this year, knowing that their accomplices in the CIOAC-Histórica know that they are guilty of organizing the crime. Justice for the compañeros for defending freedom, peace, life and the mother earth. We will continue to join the struggle, our struggle for the live appearance of the young people and for justice, so that together with other indigenous peoples, with other organizations of the country we will overcome the capitalist monster for a better world, where there will be peace, democracy, justice and a harmonious relationship with nature and the entire cosmos. The state police out of our indigenous territory! Compañeros and compañeras, we inform you that we continue in the struggle for the defence of our territory and against dispossession by the bad government which is still keeping its police in the lands that belong to us after they attacked our compañeros and compañeras with heavy calibre firearms and rubber bullets. But our compañeros and compañeras with courage and dignity told the minions of the bad government that the lands are not for sale, that we do not want the security forces and violence in our community, we just want to live peacefully, we do not want their projects of death and forced displacement. We remain peacefully at the Agua Azul turning, spreading the word of the struggle of the ejido to all visitors to the Agua Azul Waterfalls and to people traveling on the road between Ocosingo and Palenque, our organization is allowing the passage of all the people, we disclaim what people in the government and business are saying, they are spreading misinformation about our struggle sowing rumours that the road is closed and that we promote violence, it is the bad government and their police henchmen who sow violence. We share an invitation to all the compañeros and compañeras to join us on Sunday 18th January at CIDECI for worldwide Forum against dispossession and share our words. We also want to express our thanks to the international compañeros and compañeras who participated in the caravan that has completed its work, for their good hearts and for accompanying our struggle in times of high tension; their presence was important. From the northern zone of the state of Chiapas, the women and men of San Sebastián Bachajón send our combative greetings. Land and Freedom! Zapata Vive! Immediate presentation of the 43 missing of Ayotzinapa!